Born in Ontario, Pamela Fielding grew up in the New York Metropolitan area, spending summers on Lake Huron shores. Returning to Canada, she earned an Art History degree from Carleton University, worked as a theatre properties maker, museum curator and designer. Today Pamela paints watercolours in her Guelph studio, Southwestern and Northern Ontario. 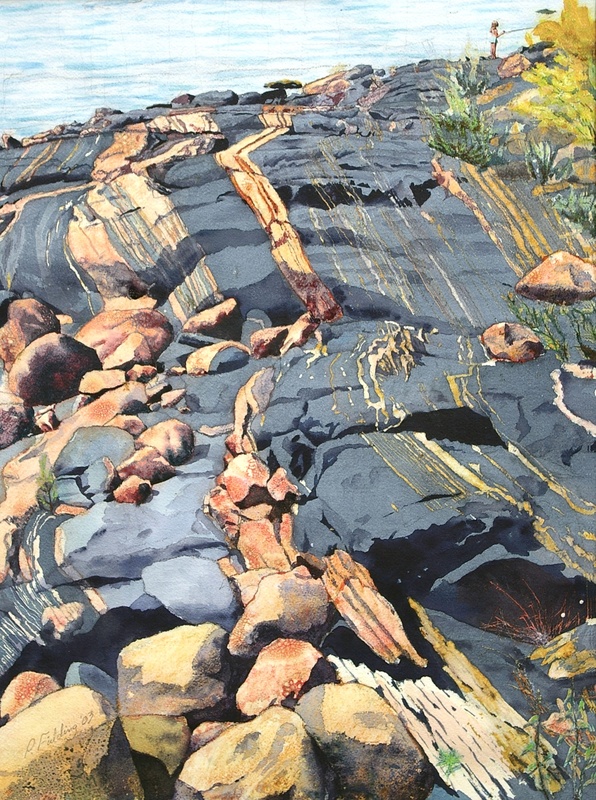 In her Georgian Bay and Muskoka series she paints Precambrian rock, balancing sinuous line with wet and dry textural effects, evocative of granite, water and wind-swept forest. These works are soaked with powerful and subtle colours drenched with delicate light. Most recently Pamela is discovering the subtle nuances of the Bruce Peninsula, studying limestone ‘pavement’ sloping into Lake Huron, spongy perforations in ochre sedimentary rock illuminated by dancing sun nets in turquoise shallows. The Skyscraper series reflects undulating forms and interlacing lines distorted in steel and glass. Intricate, colourful, abstract images emerge. Pamela’s other passions include wooden boat building, raku sculpture and Argentine Tango. She is a certified Yoga instructor. Pamela offers instruction in watercolour, art and crafts to adults and children. Artwork and wall murals are also available on commission. Please call to request a private viewing.